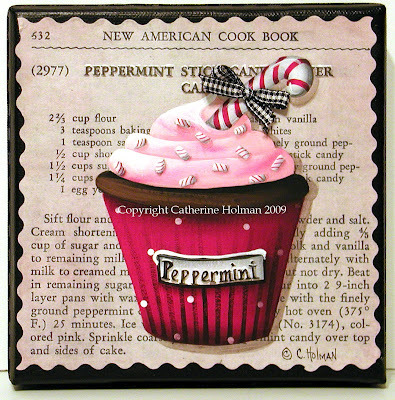 I listed this Peppermint Stick Christmas Cupcake painting on eBay last night. I like it next to my Cherry Cupcake painting and that's where it will stay until it's sold. 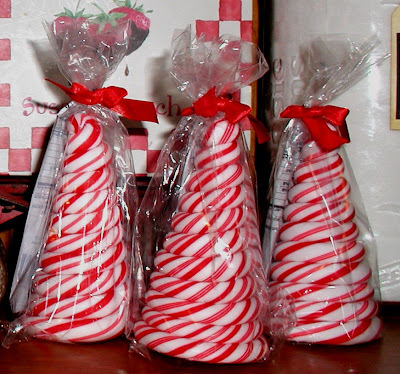 I also found the cutest little peppermint Christmas trees at Aldis for .99 cents. Haven't decided how I'm going to use them, but I couldn't pass them up. 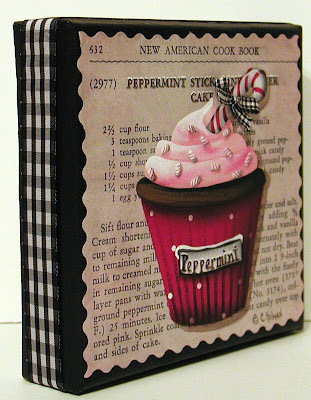 The background for this little painting is a recipe from an old cookbook that I decoupaged onto the front of the canvas. A peppermint stick in placed in the fluffy pink frosting. Tiny peppermint pieces are sprinkled on top of this deep dark chocolate cupcake. 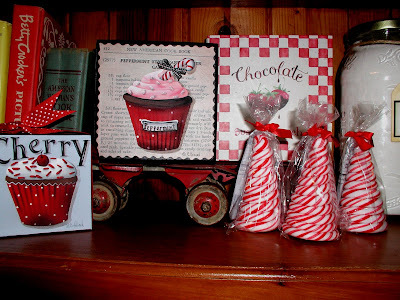 A red and white dotted wrapper is accented with a "Peppermint" tag and a tiny black and white checked ribbon is glued to the candy cane. A black and white checked grosgrain ribbon is wrapped around the edges of the canvas. Now you really have to admit that these are really cute trees. I went back to Aldis today and bought 5 more. I've still got my Christmas decorating to do when I get caught up with my painting. Also, my kitchen stove played out and I'm so excited to be getting my new one next week. Nothing like getting a new appliance for Christmas! ....or are you simply taking a break and simplifying this year? Love the peppermint cupcake Catherine...just wonderful. Love those candy trees also, I would have a series problem not eating them up. I will do some Christmas- baking tomorrow. And those peppermint trees are great - think I might need to get some. I'm hoping to get to the cabin next weekend to finish decorating but I did manage to get the tree up. Your peppermint cupcake is wonderful, Cathie! What a great idea. My Christmas decorating is coming along slowly, in fact I was working on it this morning. Our tree is finally up! How cute! I love red and white in everything and my favorite scent is peppermint. I said I was going to simplify but every day I do more! lol Happy holidays! Catherine, I just received your beautiful print...thanks so much..
Will show it on my blog soon.